In the recently aired 25th anniversary Power Rangers special aired as part of this season's Super Ninja Steel version of the classic superhero show, Tommy, the former Green Ranger, found some time to fight himself. Weirdly, he does this a lot. 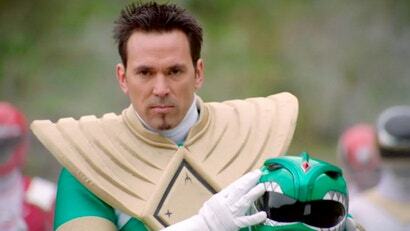 Tommy Oliver is one of the most beloved characters in the series history. Played by Jason David Frank, Tommy first played the villainous-turned-heroic Green Ranger, then the White Ranger, then the Zeo Red Ranger, then the Black Dino Force Ranger. He — he's been a lot of Rangers. Now, he still makes cameo appearances on the show for special occasions, a mainstay of special events like "Forever Red" and "Legendary Battle" and the recent 25th anniversary special. But something happens regularly, when Tommy appears. Somehow, he gets into fights. With himself. His former Ranger versions, especially his evil Green self, seem to appear through some strange means or another and, uh, try to kick Tommy's arse. My memory may be exaggerating, but in my mind this happens all the time. Going to the supermarket must be rough for this guy. So I got to wondering: how often does it actually happen? And which Tommy vs. Tommy (and sometimes Tommy vs. Tommy vs. Tommy vs. Tommy) fight is the best? Let's discuss. The classic that started it all. In this surreal three-part episode from the show's second season, a new baddie called the Wizard of Deception helps out Zedd and Rita by creating an evil clone of Tommy, who takes on the Green Ranger mantle and starts causing all sorts of trouble. Evil!Tommy is just as delightful as you might imagine a '90s evil clone to be, wearing a very villainous-looking bandanna and chomping on a toothpick, just so you know, oh, this one's the bad Tommy. The fight is pretty solid, especially for old Rangers. The best part? Tommy's sheer goodness wins over the evil version, and the episodes end with them teaming up to save the other Rangers. Redeemed, the clone Tommy stays in an alternate timeline, presumably to right what once was wronged and do a serious Ben Reilly impression. Here we go. This is the primo Tommy v. Tommy action we're after. In this episode of Power Rangers: Dino Thunder, Tommy falls into a coma, and in his hallucinatory dream state he has to fight three different versions of himself, all representing different rangers of his past. Now, normally, you'd think that an uncostumed middle-aged archaeology professor (yes, he became an archaeology professor) against three Power Rangers in their prime would be no contest. And you'd be right. Tommy kicks their asses. Good times. Good times. And, finally, the most recent addition to the knock-down-drag-out Tommy Brawl compilation, from the latest special. In this, Tommy debuts his "Master Morpher", a mysterious device that lets him transform into all of his previous Rangers iterations. That, yeah, probably breaks some plot, but we're gonna roll with it, because this fight is nice! The Power Rangers TV show isn't the sparkling, weird bundle of creativity it was in, say, the In Space days, but at least they know what the fans want. OK, so maybe he doesn't fight himself quite as often, in the show's 25-year history, as I remembered. But by my count, Tommy Oliver duels with, at one point or another, seven different superpowered iterations of himself, including two straight-up clones. That's the kind of bad luck only Spider-Man has. And then again, I didn't even count the comics, where fighting an evil version of Tommy is, like, the whole deal. Here's to many more years of Power Rangers, and just as many more years of Tommy beating the crap out of himself.